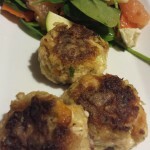 Well my friends I’m starting the New Year with a lighter version of my original fish cakes you will love these! I’m wishing you all a Happy New Year and good health and happiness in 2014! In a large bowl, combine the cooked fish, bread crumbs, onions, bell pepper, cilantro old bay seasoning, crack black pepper and mayonnaise. Mix until will incorporated. Form into 8 small cakes. Cover cakes with plastic wrap and refrigerate at least 1 hour. Place the flour on a sheet of wax paper and lightly coat the cakes with flour. In a large non-stick skillet, melt butter with olive oil. 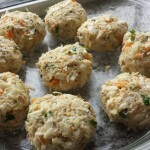 Cook fish cakes until golden brown and crispy 4 to 5 minutes on each side.